Home » What’s the Best Generator For Your RV? Every RV model is different, whether in its shape, size, battery storage system or accessories. What works for your friend’s RV might not work for yours, it’s all about assessing what you have and making the right choice for your RV. That’s especially true for finding the portable generator you use to power appliances on your RV when you camp. RV generators, as we know, come in all types, shapes and sizes. Selecting the best generator for your RV can be a daunting task. You’ll have to figure out which type of generator is right for your RV or how much juice you’ll need to run the appliances you use throughout your travels. For instance, if you know you’re only going to need to run a few small appliances and charge the RV’s deep cycle batteries, a smaller quiet portable generator, such as the Honda EU2200i Inverter Generator, is going to be the best generator for your RV/travel trailer. 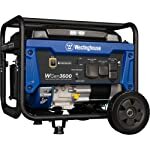 Whereas if you’re traveling in peak summertime and you’ll be off the beaten path for a while, you’ll probably need an RV air conditioner on the rooftop, and a few major appliances, so the best generator for your RV might be a larger model such as the Champion 3800-Watt Dual Fuel RV Ready Portable Generator. In this article, we walk you through the process of selecting a portable generator for your RV or travel trailer. We talk about the pros and cons of each generator fuel type, and then some of the ways you can determine how much power you’ll need, and finally are our reviews on some of the best RV generators on the market today. Let’s get started! Honda generators are Number 1 when it comes to reliability, durability, and portability. They are also significantly quieter than other brands. The Honda EU2200i Portable Inverter Generator is our pick for the best generator for RV. It delivers 10 percent more power than the legendary top-selling Honda EU2000i model, both have the same quality and represent the leading edge of portable power technology. 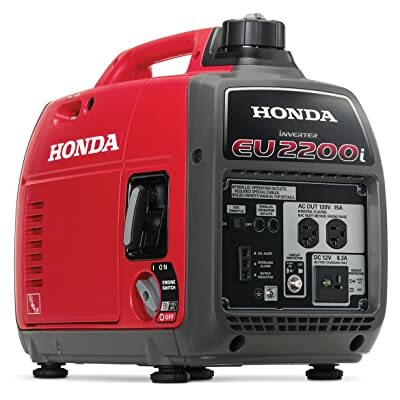 Not only is the Honda EU2200i one of the best portable generators for your RV, it’s one of the quietest RV generators available. It produces even less noise than a normal conversation, which is ideal for using at RV campgrounds or anywhere you need reliable power with minimal noise. The Honda EU2200i is also surprisingly fuel-efficient – it can run up to 8.1 hours on just 0.95 gallons of fuel at 25% load. The Honda EU2200i is a great option for most RVers because it’s a combination of portability, capability, and low-noise level. 1800 rated power is enough to power most devices you need on a camping trip. 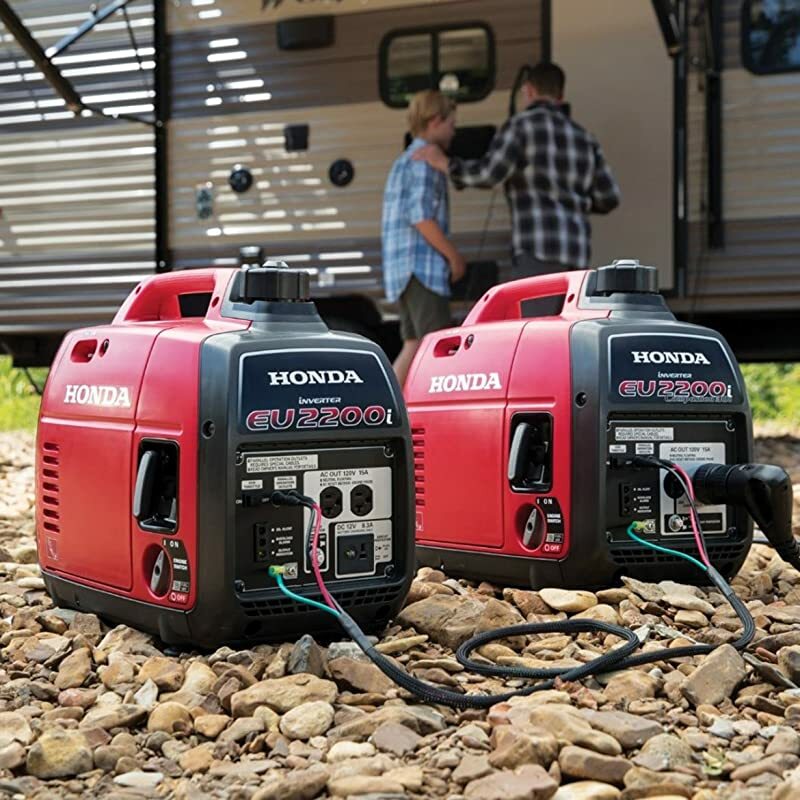 When need more power to run your RV’s rooftop AC, you can connect 2 of Honda EU2200i portable generator in parallel to get up to 4400 surge watts, 3600 rated watts. Or another way is to buy the below model. The Champion 3400-Watt Dual Fuel RV Ready Generator was our top pick of the best quiet RV generator. It was even quieter than the Honda EU2200i under a 1,500W load. And unlike the Honda EU2200i, this Champion generator runs on either gasoline and propane and can power your RV air conditioner. When running on gasoline it produces 3400 starting watts and 3100 running watts and will run for 7.5 hours at 25% load. On propane it produces 3060 starting watts and 2790 running watts, and will run for 14.5 hours at 25% load when using a 20-pound propane tank. That’s enough to run a wide variety of devices and appliances that you may have. What makes this generator more enticing is the fact that this generator is RV ready. Meaning it’s specifically designed for RV use. It has a 120V 30A RV (TT-30R), two 120V 20A household outlets (5-20R), a 12V DC automotive-style outlet with a dual USB adapter. 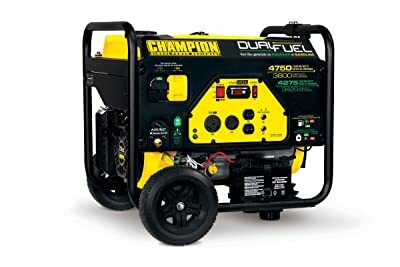 Additionally, it is also parallel ready and has the ability to connect with another Champion 3400 Watt for increased power output. Those are the models that we rate are two of the best generators for your RV and the specific needs of your trip. But if you don’t like them, read on to figure out the ideal model. Propane vs Gas vs Diesel Generator – Which is Best for Your RV? For many RVers, the first consideration when shopping for an RV generator is what type of fuel they would like to burn. RV generators can be powered by propane, gasoline, or diesel. Some models allow you to switch between fuel types. Each of these fuel types can differ greatly in how they function, how long they last, how much they cost, and in how easy it is to gain access to them as well. Similarly, the best generator for your RV will vary depending on the type of fuel you are considering. Like the name implies, a propane RV generator utilizes propane as the fuel source to convert to electricity. Propane requires a tank separate from the generator itself. These tanks can be the same kind used for fueling heaters and grills, or you can rely on a larger, stationary tank that must be periodically refilled by a service truck. 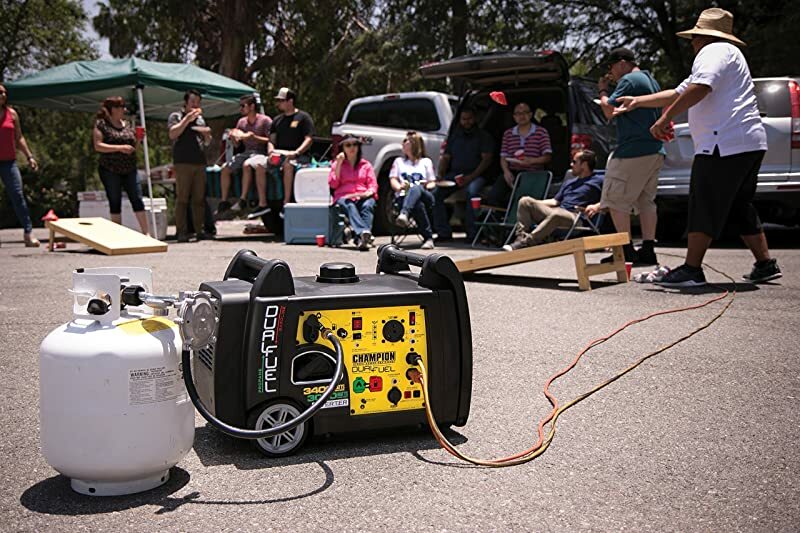 RV propane generators beat out other options when it comes to portability and safety. Propane is considered a clean-burning fuel – it’s nontoxic and produces fewer emissions than some other fuel types do. Unlike gasoline and diesel, propane will not degrade in storage, so it is a viable option for people who rarely or sporadically use their generator. Propane is also safer to store. Except in the coldest of environments, propane works well. If you are in an area where the temperature is below zero °F then gasoline might be a better option for you. For us, storing gas is an issue because we are so prone to wildfires and gas is highly flammable. An RV generator using propane can require less maintenance than one that using gasoline or diesel. Gasoline and diesel leave carbon deposits in your engine and exhaust, which need to be cleaned from time to time. These fuels also leave residue in fuel lines and system parts, adding additional maintenance. Propane has none of these effects upon engines, making propane generators easier to maintain. Some of the best propane-powered RV generators won’t require any fuel maintenance, other than ensuring your tank is adequately full. The only drawback of RV generators using propane is that they aren’t quite as efficient as gasoline or diesel RV generators. The reason that they might use more fuel than other types of RV generators is simply a matter of physics. The amount of energy, or energy density, that propane is capable of producing when it burns is simply less than both diesel or gasoline. The fact that there are very few portable generators for RV that only use propane. Most propane-powered generators are hybrid or dual-fuel, which can be powered by either propane or gasoline. One of the best generators for RVs that is powered only by propane is the Sportsman GEN4000LP Propane-Powered Generator (4000 watts surge/3250 watt continuous). This generator is significantly less expensive than other similar-sized dual-fuel generators. Gas-powered RV generators are the most common, due to the ease of access and relatively low cost of gasoline – it’s not necessarily the best option for all situations, but it’s what you’ll see most RV generator units using. Gas-powered RV generators tend to be less expensive than other models. Gasoline is very available so it’s very easy to refill a gas powered generator or keep reserve fuel around. RV generators using gasoline generally more efficient fuel than their propane-powered cousins so you can power more RV’s appliances at a given time. But gasoline less efficient than diesel. Theoretically, diesel has an energy density of 35.8 megajoules per liter (MJ/L), and gasoline has an energy density of 34.2 MJ/L). Propane, however, only has an energy density of 26 MJ/L. Gas-powered RV generators require more upkeep and care than other fuel models. Gasoline is slightly more dangerous to store than propane and diesel, as it has a very low flash point, and is an extremely flammable liquid. Gasoline also has a relatively low shelf life, and most blends begin breaking down or absorbing moisture within a month. Even gasoline that is several years old is viable, but it may contain elements that will break down or wear engine parts. If you have a mid-sized RV that uses a moderate amount of power, then a gas-powered generator is probably the best option. Most of the best generators for RVs that we review in this article are gas-powered. Diesel-powered generator is the most powerful of the generator types when comparing apples to apples. Diesel-powered generators are the best choices if your RV runs on diesel fuel like many Class A motorhomes so you only need to use one fuel source. They are cleaner burning than gas-powered generators. Diesel generators require less upkeep and are more efficient than other fuel types. They are typically preferred for their efficiency and low maintenance. Diesel is the most efficient of generator fuels, most diesel generators provide more horsepower per gallon of fuel than comparable gas-powered generators. Although diesel generators have a reputation for being more durable than gas, if they are not run regularly they may be more prone to breaking down. Like gasoline, diesel will burn even after years of storage, but it may degrade the workings of your engine. Diesel is also much more expensive than gasoline or propane and harder to find. The generators themselves are typically the most expensive. 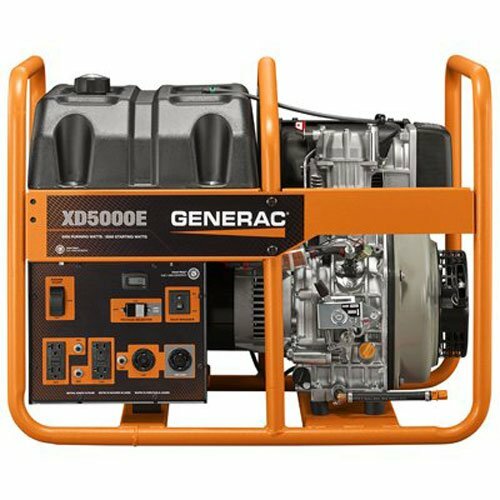 The Generac 5,000-Watt Diesel Portable Generator is a very good option to consider if you’re after a diesel-powered generator. Dual-fuel generators allow the user to switch between gasoline or propane. One of the biggest reasons people prefer the dual generators is convenience. If you are in your RV traveling across the United States, you may not be able to find propane or natural gas, but typically gasoline is available at every exit and in small towns. Therefore, you may choose to run the fuel type that you prefer, but have another fuel as a backup in case you run out somewhere along the way. When it comes to the best gas-powered generators for RVs, most RVers recommend models from Honda and Yamaha. They are generally more fuel efficient and much quieter than other cheaper generator models. But when it comes to dual-fuel generators, the Champion dual-fuel generators are the most frequently recommended. Most of Champion’s dual-fuel generators get solid reviews. We’ve heard very little negative feedback from actual users. What Size RV Generator Do You Need? To find out the best generator for your RV, you will need to determine the right size of the generator. RV generators come in various sizes available range from 500-watt generators to 4000-watt generators, all the way up to 6500 watts. The number of options is actually quite impressive. How much power you use will determine the size of RV generator you’ll need. The 2,000-2,500 watts portable generators are the best option for RVers who only use a moderate amount of power and to charge the deep cycle batteries. 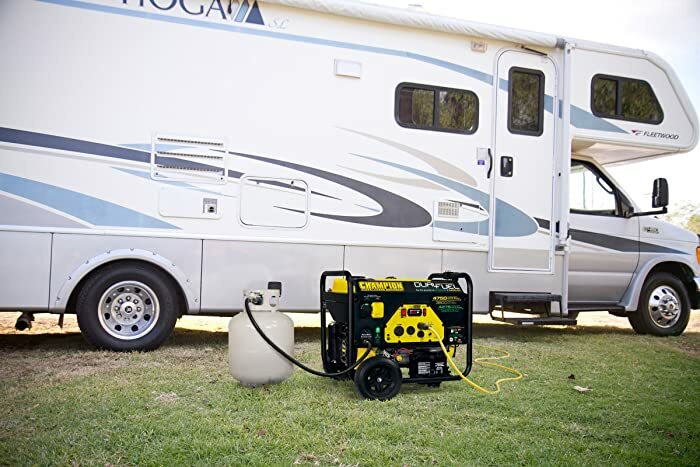 The 3,000-4,000 watts portable generators will power everything in your RV including your RV air conditioner, which we think is also the most ideal option. An RV with a 13,500 BTU air conditioner will probably need a 3000 generator, and an RV with a 15,000 BTU air conditioner will need at least a 3300W generator. That is, of course, if you don’t turn on any appliance simultaneously with the AC. You also need to know that most RV generators have a starting watt and running watt rating. For example, the Champion 3400 Watt RV Ready Dual Fuel Inverter will produce 3400 starting watts and 3100 running watts on gasoline. So a 3,400W RV generator might give you up to 3,400W to start that air conditioner, but for long-term use might only be rated 3,100W. So after your 3,400W RV generator starts your 13,500 BTU air conditioner which might run at 2000W, you have around 1,100W to use on other items. We recommend not compromising on the size of RV generator you purchase. When boondocking or dry camping and it’s a hot day, you’ll be thanking yourself for investing in a high wattage generator that powers your rooftop A/C alongside your coffee machine. The best generator for your RV should be the one that is enough power to run everything you need on a camping trip. Without an RV air conditioner, the portable generators under 2,500 watts, such as Yamaha EF2000iSv2 or Honda EU2200i inverter generator, would be enough to run most of devices and appliances in your RV, including microwaves or refrigerators. Inverter vs. Conventional Generators – Which is Best For RV? When you’re shopping for an RV generator, you’ll see two basic types: old school conventional generator and newer inverter-style generator. Which is the best generator for RV? Conventional generators, such as the Westinghouse WGen3600, have been around for quite a while, and the basic concept behind them has remained essentially unchanged. They consist of an energy source, usually a fossil fuel such as diesel, propane or gasoline, which powers a motor attached to an alternator that produces electricity. The motor must run at a constant speed (usually 3600 rpm) to produce the standard current that most household uses require (in the U.S., typically 120 Volts AC @ 60 Hertz). If the engine’s rpm fluctuates, so will the frequency (Hertz) of the electrical output. Inverter generators, such as the Honda EU2200i, produce DC power and then convert it to AC current via digital magic. This allows for the on-demand production of the electricity you actually need, meaning a quieter, more efficient operation – all in a lighter, smaller machine. And some come with surge protecting GCFIs, which gives a more stable power stream akin to power lines. The rub comes at the price. Inverter generators cost 3–5 times more than a conventional one. The best generator for your RV may boil down to what you’re powering. If you’re only looking to keep the milk fresh in the mini-fridge or need big power for air conditioning unit, a cheaper conventional generator may be right for your RV. But if you need to keep sensitive equipment like computers online, a smaller inverter generator with surge protection might be better for your needs. Inverter generators are designed to mirror a pure sine wave inverter, they are safer to run laptops, cell phones, monitors, tablets and other vulnerable electronics in your RV. Inverter generators also differ widely from conventional generators when it comes to noise. Inverter generators are designed to be comparatively quiet. Quieter engines, special mufflers, and sound-dampening technology are used to reduce noise to amazingly low levels. All of the quietest RV generators available are inverter generators. An inverter generator running low, could be the equivalent of people conversing (50-65 dB). Instead, many conventional generators can have the same noise range as a lawnmower. Many of the new inverter generators are surprisingly small and lightweight for the electrical generation punch that they pack. Sizes of just a couple of cubic feet and weights in the 30 to 50 pounds range are not uncommon today. For example, the Yamaha EF2000iSv2 weighs only 43 pounds while produces up to 2000 peak watts (Honda EU2200i is 47 pounds). To give you a better idea, we’ve compiled a comparison table below, and indicated which type of generator comes out on top for each of them. So you can easily select the right type of portable generators for your RV. Now it’s time to look at some of the best and quietest RV generators available to you. In our opinion you can’t go wrong with Honda portable generators, they are the NUMBER #1 when it comes to reliability and quality. 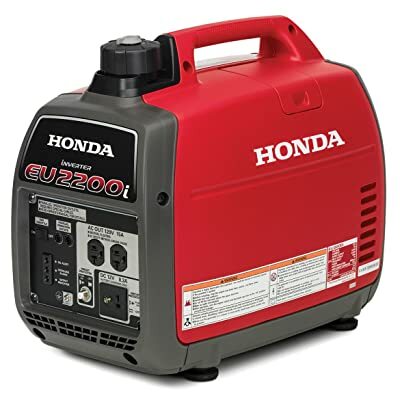 Honda portable generators are famously fuel efficient and quiet. The Honda EU2200i Portable Inverter Generator is one of the Honda’s top-selling generators and it’s our pick for the best RV generator. It delivers 10 percent more power than the legendary top-selling Honda EU2000i model, both have the same quality and represent the leading edge of portable power technology. The Honda EU2200i is surprisingly quiet. It generated only 57 dB from 20 feet, which was quieter than most, or maybe all, RV generators we’ve ever seen. To put that into perspective, the noise will be somewhere between listening to a normal conversation and sitting in a private office. Plus, while this inverter generator puts out up to 1800 watts at full load, it is incredibly lightweight and portable, only less than 47 pounds. So if a lightweight design and quiet operation are your top priorities when shopping for an RV generator, the Honda EU2200i is probably the best choice for you. Overall, from our own reading reviews from buyers on Amazon.com, talking to the real users, and browsing many RV forums, we can tell that the Honda EU2200i inverter generator is the best generator for RV and camping. It would be enough power to run most devices you need when RV camping, but if you need more power to run RV air conditioning unit, you can add a second EU2200i to double your power, up to 4,400 watts max. 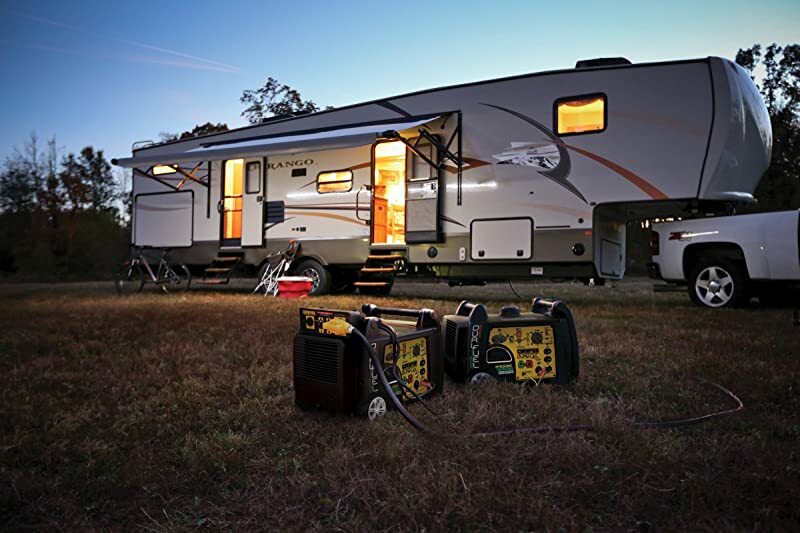 The Champion 3400-Watt Dual-Fuel RV Ready Portable Inverter Generator was our top pick for the best quiet RV generator. It was even quieter than the Honda EU2200i under a 1,500W load. And unlike the Honda EU2200i, this Champion generator can handle a 15k BTU A/C unit and runs on either gasoline and propane. This is a huge advantage for those in an RV or Travel Trailer as many already have propane on board. Although, when operating on propane the generator does not produce as much power. You can also run two RV air conditioning units at the same time by connecting two generators together via the optional Champion Parallel Kit. The Champion Parallel Kit is designed to easily clip-on and connect to two 2800 Watt or more inverters and comes travel-ready with standard 50A RV outlet with enough power to start and run two 15k BTU RV air conditioners. That truly is convenient in such a way that you can easily get more power when you need it, without having to trade up for a larger, heavier RV generator. You get more power without sacrificing portability. For that reason, we think the Champion 3400-Watt Dual-Fuel RV Ready is the best generator for your RV if you’re looking for a generator model that is able to handle your A/C unit in the hot days while has the ability to extend the power whenever you need. The Champion 3400-Watt Inverter Generator has a run time of up to 7.5 hours on a full tank of gasoline or 14.5 hours on a 20 lb. propane tank at 25% load. It features a push-button electric start and a built-in Volt Guard to protect your devices from sudden voltage spikes and power surges. 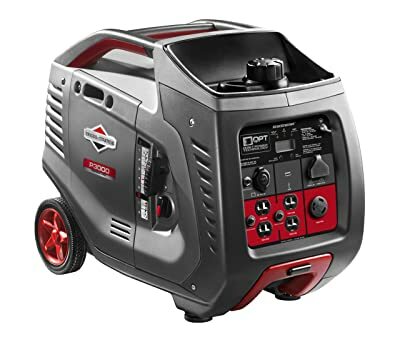 It includes a 120V 30A RV (TT-30R), two 120V 20A household outlets (5-20R), a 12V DC automotive-style outlet with dual USB adapter, plus a propane hose with a built-in regulator. If you need more power from your RV generator but you don’t have much money to spend, and a quiet operation isn’t your top priority, then the Champion 3800-Watt Dual Fuel RV Ready Portable Generator is a very good option to consider. This unit provides more power than the Champion 3,400W dual-fuel inverter generator but is only half of the price. When using a 20-pound propane tank, it’s capable of producing 4275 starting watts and 3240 running watts, and will run for 20 hours at 25% load – the running time is much longer than that of the Champion 3,400W. When running on gasoline, it produces about 4750 starting watts and 3800 running watts, and will run for 9 hours at 50% load. You can use this generator to run a 15k BTU A/C unit and several appliances in your RV simultaneously without any issue. As one of the best generators for RVs that Champion offers to the market, the 3800-Watt Dual Fuel already comes with a standard 30A RV outlet. It also features Volt Guard built-in surge protector which prevents overloads and keeps your RV’s appliances safe. There are also plenty of outlets available: a 120V 30A RV (TT-30R), a 120V 30A locking outlet (L5-30R), and two 120V 20A household outlets (5-20R). The convenient electric start includes a battery, plus Cold Start Technology ensures a quick start in cold weather. Finally, Champion’s thoughtful packaging make setup hassle-free, plus the foldaway handle makes it easy to store, while the never-flat tires in the included wheel kit make transport a cinch. 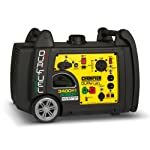 Overall, if you’re looking for an inexpensive portable generator that will give you an awesome power, the Champion 3800-Watt Dual Fuel Portable Generator is one of the best generators you can buy for your RV. Though with a noise level of 68 dBA from 23 feet, it can be quite a bit loud. When it comes to the best portable generator for RV and camping, most people recommend models from Honda and Yamaha. They are generally more fuel efficient, more versatile, and much quieter than portable generators from other brands. We think you can’t go wrong with either of those two. They get so many positive reviews from both owners and fellow professional reviewers. And the fact that we’ve heard very little negative feedback from users about Honda’s and Yamaha’s generators. 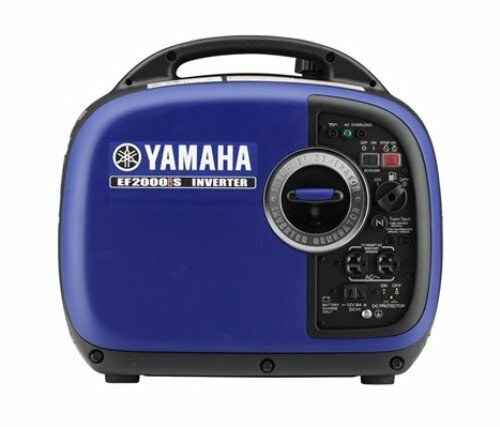 The EF2000iSv2 Gas Powered Portable Inverter is Yamaha’s top-selling generator. It competes directly with the Honda EU2200i in price, features, and noise level, but it delivers 10 percent less power (200W) and has a slightly smaller engine – which makes it lighter than the Honda (44.1 lbs). The Yamaha EF2000iSv2 produces 1600 watts of running power and 2000 starting watts. This is not the one for running multiple devices in your RV at the same time. And also not enough power to start up a 13,500 BTU air conditioner. However, if you use a small window air conditioner in your RV, this portable generator would work without any issues. Additional features include an Oil Watch Warning System to prevent engine damage, a 12-volt DC outlet and included cables to charge any 12-volt battery. Easy-to-read fuel gauge. The parallel function lets you connect an additional generator for extra amperage. Gasoline petcock allows you to shut the gas off and run the carburetor dry for storage. The Westinghouse WGen3600 Portable Generator is a great option if you’re after an inexpensive RV generator that is powerful enough to do most jobs for which you might use it. Like the Champion 3,800W dual-fuel above, this Westinghouse generator is an open frame generator. The biggest advantage of an open frame generator is the price. It can be significantly less when compared to a similar-sized inverter generator. With that cost saving does come a heavier and louder unit. The WGen3600 runs at 3600 running watts and 4650 peak watts due to its solid Westinghouse engine. The engine in this unit is 212cc and OHV, contained in a cast iron sleeve for strength and protection. When a 4-gallon fuel tank is full, the engine can run for approximately 18 hours at a 25% load. The WGen3600 comes with two 5-20R 120V household duplex receptacles, one RV-ready TT-30R 30 Amp Receptacle, and one L5-30R 30 Amp Receptacle. All have rubber covers for added protection. The unit is also made for easy use. It comes with modern parts, such as the helpful, intuitive control panel. The operation is easy for most adults. With such many convenient features and a warranty up to 3 years, this is definitely one of the best generators for RV you can buy without breaking the bank. But if you’re looking for a really quiet RV generator for using at campgrounds, we’d suggest you consider another model. Engineered to be ultra portable and ultra powerful, the Briggs & Stratton P3000 PowerSmart Inverter Generator is the ideal power-house for dry camping or boondocking. 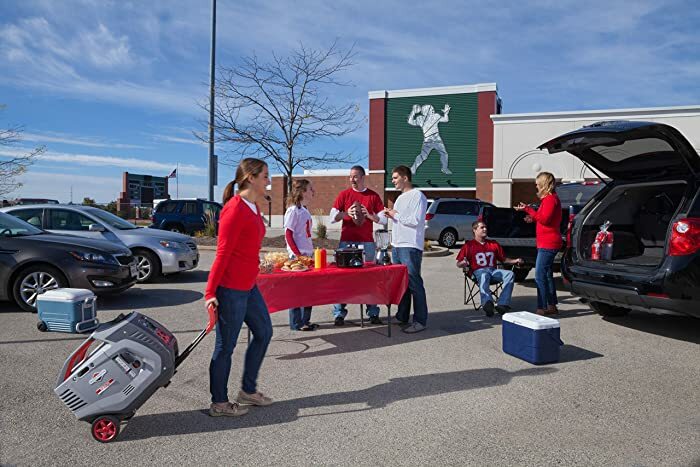 With a 3,000 starting watts/2,600 running watts output, this is a monster that produces enough power to run just about everything you need, where ever you want to go – from the most basic tailgate essentials to higher-wattage items including: big screen TVs, crock-pots, small refrigerators, microwaves and a 13,500 BTU RV air conditioning unit (not all at the same time). The P3000 comes equipped with all the bells and whistles you might expect from Briggs & Stratton, including an auto-idle mode recommended for best fuel economy, a standard fuel gauge and a handy LCD display “StatStation”. The Briggs & Stratton StatStation display – although it might sound simple, this digital readout shows you exactly how much power you’re sucking – and prevents a nasty power overload. 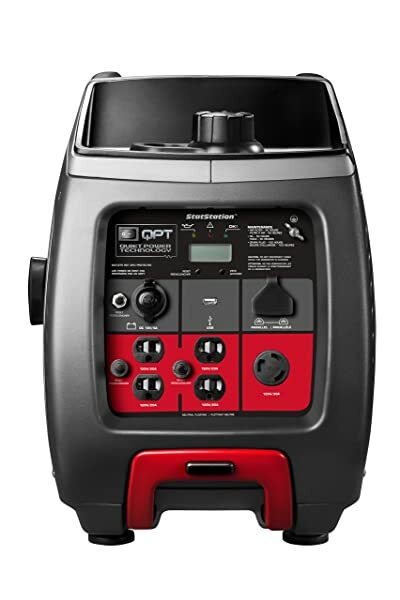 In addition to the RV ready connection, including one 12V DC outlet and one 120V 30A RV outlet, you will take advantage of the 4 onboard 120V outlets, as well as the USB connection. If you often travel with lots of gear, these dedicated outlets would come in handy – providing a charge to your phone, camera, and many devices with ease. But what really impressed us about this generator was the fact that while it weighs up to 84 lbs, it is very easy to move around. At the back of the generator you’ll find two beefy air-less wheels and at the front a telescopic handle – allowing you to drag the generator around with you effortlessly. Not to mention, up-top there is twin lift handles that allow two people to lift this generator with ease. Overall, the Briggs & Stratton P3000 PowerSmart is one of the best generators for RV camping and power outages with plenty of power and so many awesome features.